Bishop Cotton School Shimla is the first school in the country to introduce SCUBA DIVING as an adventure sports activity. BCS is expected figure in the LIMCA Book Of Records for this achievement. Congratulations to all! This entry was posted in Articles, Post, Spot Light and tagged BCS, BCS News, News article, sports on July 21, 2012 by admin. This entry was posted in News, Post, Spot Light and tagged Articles by OCs, News article, Robin Gupta, Spot Light on December 22, 2011 by admin. Karen Ann Monsy interviews Ruskin Bond [Bishop Cotton School 1943-1950 Ibbetson House]. As published in the Khaleej Times WKND Magazine of 9th December 2011 reproduced below. The original article photos and can be read here. Sixty years on and with pen firmly in hand, Ruskin Bond proves he’s still as capable of enchanting readers as he was when he first began. Hundreds of screaming fans in a tent packed beyond seating capacity. That an audience could be just as captivated today by the man whose storytelling first fired up their imaginations as little children decades ago was a testament to just how popular an Indian author by the name of Bond — Ruskin Bond — could be. 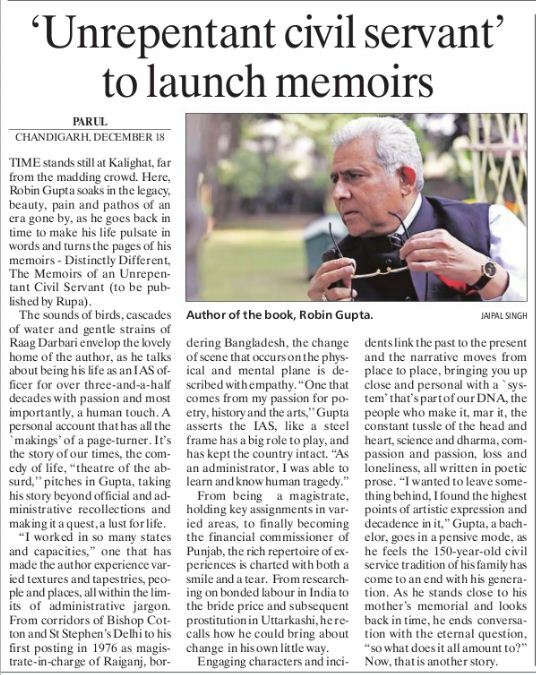 This entry was posted in Articles, Post, Spot Light and tagged News about OCs, News article, Ruskin Bond, writer on December 13, 2011 by admin. Bon appétit – OCA Dinner. Five months ago, I was surprised to receive an email from Sukhinder Singh and Vijay Khurana to attend the 50th class reunion. I apologize for taking so long to reply. Firstly, I was in the process of moving. Secondly, since I could not attend, I did not feel I could contribute anything. I have included the 1956 Upper II photograph originally sent by Brandy Gill. If my memory is correct, the person in the second row behind the 7th person from the left in the front row (the person with eye glasses) is Bentick ( I don’t know if I am spelling the name correctly; I don’t know if that is his first or last name). Minor correction to Sukhinder Singh’s message “we were together in the III form” It should read Upper II and not III Form. I left after completing Upper II, the year this photograph was taken. I joined BCS in 1952 when I was 8 years old and I was expelled from BCS in 1956 when I was 12 years old. Sitting first row: (left to right) Gurdial Singh, Brandy Gill, KS Dugal, Sabharwal (Rivaz, left to join Doon), RLV Nath (second from right same row). . . but none of the others . Standing second row( left to right) Rupinder Singh, Rakesh Sawhney, unknown and Ramesh Suthoo. 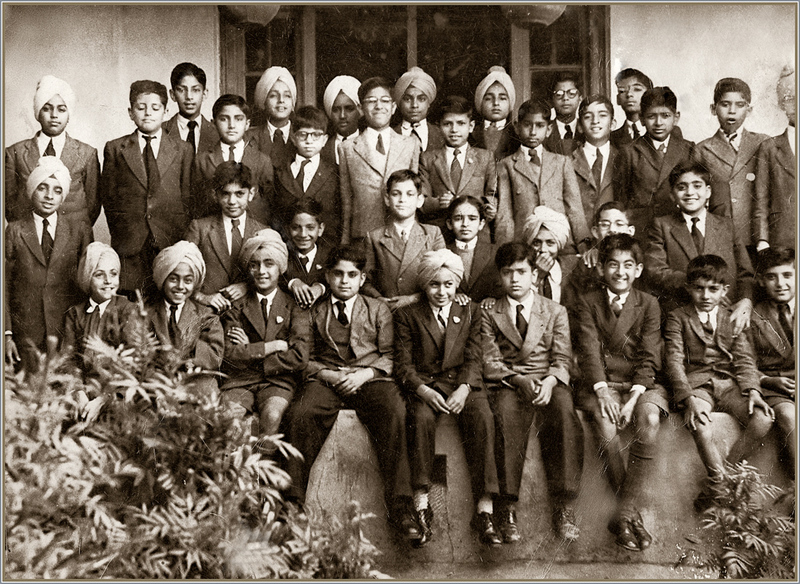 Standing third row (left to right) unknown, unknown, Ashok Anand, Ashok Mulchandani, unknown, SM Nanda, Himmat Singh, AK Stokes, unknown, Inderjit Singh (Badal). I considered Upper II as the 7th grade and VI Form as the 12th grade. After leaving BCS, I joined Modern School, New Delhi, in the 7th grade. This did not work out and I did not cooperate. I was in the boarding school. My parents then put me in day school. I was staying with my father’s friend. They thought that perhaps I was afraid of girls as Modern School is coeducational or perhaps I did not like the Hindi medium of instruction. Little did anyone know what upset me. I was only 12 years old and kept everything to myself. What bothered me was why they put me in the 7th grade when I had already completed the 7th grade in BCS. If you remember, I use to be on the top or near the top of my class. To make a long story short, I lost one year doing nothing. In 1958, my father put me in Hyderabad Public School. I insisted that I join the 7th grade which the school accepted. Luck would have it, their grading system was different. Their highest grade was not 12th grade but 10th grade. (On the first day of my class I had my Geometry class. I started with the 49th theorem. Within a few days I started to learn Algebra, Trigonometry and Calculus!) So I gained two years and lost one year. That is why I graduated one year before my classmates in BCS. This is not the end of the story. My father and my elder brother both graduated in Engineering from Benares Hindu University. The only college that I applied to was Benares Hindu University. The university was prejudiced against Senior Cambridge students as it was a foreign examination. I was told I did not qualify for admission. My elder brother told me that I was foolish in applying to one college only. Once again, luck was on my side. The son of the Vice Chancellor of Benares Hindu University was in the same predicament that I was. Finally, the university admitted Senior Cambridge students. In the first year of college I stood first in my class. From then on my mother had complete faith in me. This experience had a profound effect on me. We are taught to think within a box. This taught me to think outside the box. I had proposed to the Government of India for providing nuclear fuel two times in 1970 and 1985. 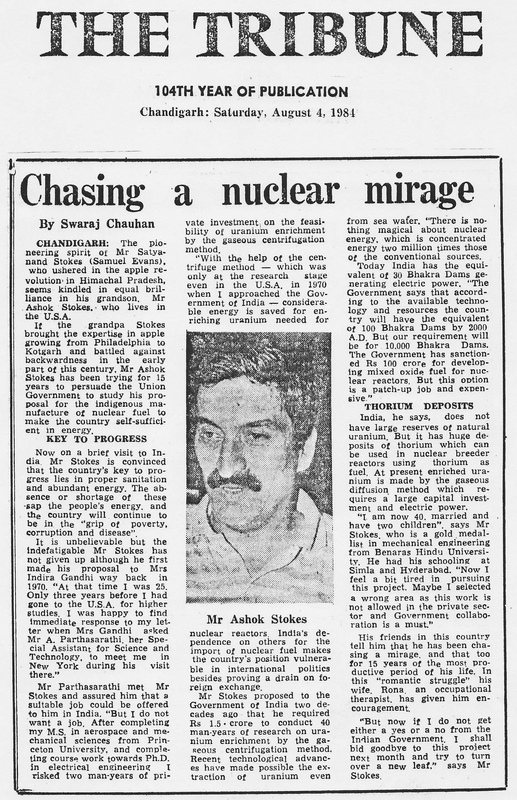 Enclosed is a 1984 article from The Tribune, Chandigarh. Both my attempts were unsuccessful and I gave up on this good idea. Toastmasters International is a nonprofit organization that teaches public speaking, communication and leadership skills. It has 270,000 members; 13,000 clubs in 116 countries. I have been a member for 17 years. We practice original speeches that last between 5 to 7 minutes.From time to time, I have given speeches on energy in general and nuclear energy in particular. The purpose is to explain in a non-technical the various facets and aspects of energy. I had stated earlier that I felt I could not contribute anything. Then, it occurred to me that this information would be educational to the students at Bishop Cotton School. I have introduced several new terms such as Nugami (portmanteau of Nu for new or Nu from Nuclear and gami from origami) and Hatt (portmanteau of H from Heat and att from Watt). My proposal was based on providing 100% Nuclear Energy. This included both generating electricity and providing hydrogen fuel for automobiles by the electrolysis of water. France has come close to providing 100% electrical energy though they have not gone as far as using hydrogen fuel. They closed the last coal mine a few years ago. So far only Iceland and a few other countries have experimented with hydrogen as a fuel. I had proposed one 1 Gigawatt Electrical / 3 Gigawatt Thermal (in my terminology 1 Gigawatt / 3 Gigahatt) Nuclear reactor for every 100,000 (one lakh) population. The title of my paper is: Energy is almost God… and God said “Numbers do not lie”. I had hoped to complete this paper by now but it has taken longer than I had estimated. Firstly, I had changed from a Microsoft PC to an Apple Mac and had minor software issues in producing the documents. Secondly, some of the documents were done on a phototypeset over 40 years ago. I want to convert these documents into digital format instead of just scanning the documents. As a sneak preview I have included a document “Nugami.pdf“. When you print this, make sure the “Page Scaling” is set to “None” so that you get a full size of the drawing. If printed correctly, the 32 x 32 grid should measure 6.375 inches by 8.25 inches (75% of 8.5 inches x 11.0 inches sheet of paper). Hope to send the complete article as soon possible. Maybe the students at BCS will find it useful educationally. This entry was posted in Articles, Events, News, Post, Spot Light and tagged 1961 Batch, Articles by OCs, Ashok K Stokes, Get together, memoir, News article, Spot Light, Sukhinder Singh, Vijay Khurana on September 18, 2011 by admin.